Lace veils, feathered fans - the romantic flirtation of a bygone era. Lacy curves of antiqued brass filigree sparkle enticingly with Swarovski crystals in light blue, pink and purple - a return to the lost art of quiet fascination. Necklet adjusts 15-17"; drop earrings have lever backs. Handcrafted in USA by Anne Koplik. Sorry, earrings no longer available. These are gorgeous! They're also lightweight and the light picks up the color of the cyrstals. 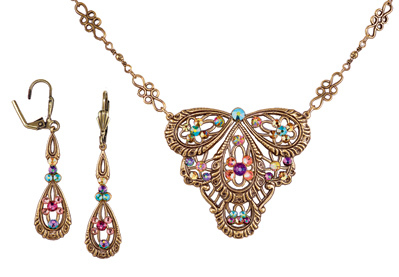 Love the filigree work, the rainbow hued crystals, and the delicacy of the artistic design. Very pleased with my necklace. I just love these type of dangling earrings. Beautiful, especially with the swarovski crystals. Very nice piece was as described.